PULLMAN, Wash. – For National Poetry Month in April, Washington State University Libraries is sponsoring three weeklong activities to celebrate all forms of poetry. Inaugurated by the Academy of American Poets in 1996, National Poetry Month is the largest literary celebration in the world with schools, publishers, libraries, booksellers and poets celebrating poetry’s vital place in culture, according to the Poets.org website. “We want to celebrate poetry as literature and art and also inspire students to interact with poetry and our libraries in a fun, creative way,” said Holly Luetkenhaus, WSU Libraries instruction librarian. 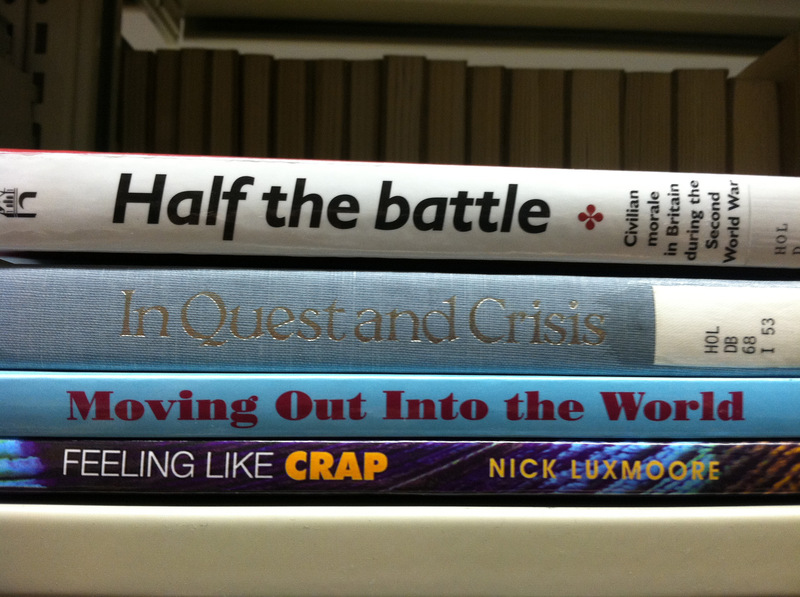 Spine poem by Holly Luetkenhaus, WSU Libraries instruction librarian. 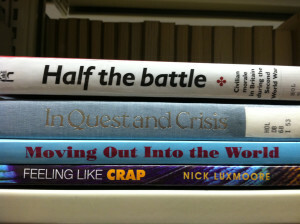 • April 4-8: “Spine Poetry.” Spine poems are photographs of poems created from book titles on the spines of a small stack of books. Luetkenhaus and social sciences librarian Lorena O’English encourage visitors to hunt for titles in the library book stacks, build their poem, take a picture and send it by email (wsulibrariespullman@gmail.com) or Twitter (@WSULibraries). • April 11-15: “Poem in Your Pocket.” Visitors can pick up poems to take home or share with others. O’English suggests taking two poems, for your pocket and that of a friend; posting a poem on Twitter (#pocketpoem); writing or photocopying a poem and leaving copies anonymously all over campus; and leaving a copy of your favorite poem in the dullest book you can find as a treat for the next reader. • April 18-22: “Dada Poetry.” The Dada or Dadaist poem sprang from the European avant-garde art movement of the early 20th century, embracing all things nonsensical, experimental and surreal. Kits will be available for people to create their own Dada poems and post them on a display board. Email or tweet Dada poems to Luetkenhaus or O’English, and they will print and display them. Displays of all poems will stay up in Terrell throughout the month. For more ways to celebrate National Poetry Month, visit http://www.poets.org/national-poetry-month/30-ways-celebrate-national-poetry-month.